More than 650 million of the world’s poorest people still have no access to an “improved” source of drinking water, says “Water: At What Cost?”, a state of world’s water report published by international non-profit WaterAid on March 21. The report overturns the assumption that the poorest people in the world don’t have formal water supplies because they cannot afford the bills. It cites different case studies to show that the poorest are already paying—often far more than wealthier fellow citizens who have an “official” water point. The price paid by these communities—in terms of wasted income, ill-health and lost productivity—is extremely high, and has a devastating impact from the family to the national level, says the report. The World Health Organization (WHO) states that a person needs 50 litres per day as the recommended “intermediate” quantity to maintain health, hygiene and for all domestic uses. 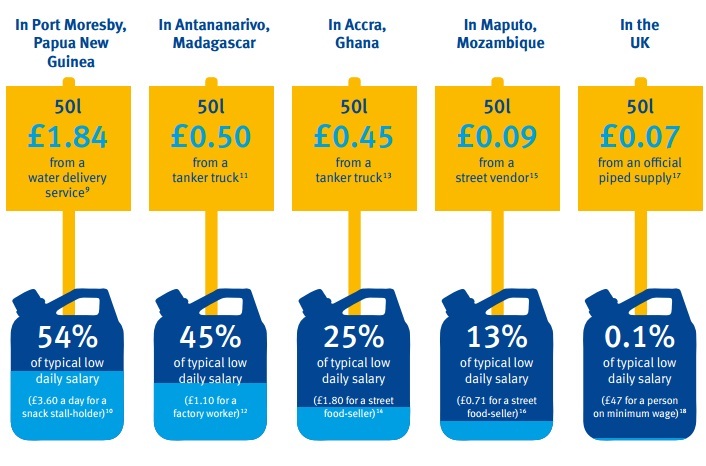 For a poor person in the developing world with no access to safe water at home, buying the recommended 50 litres a day can be a huge drain on their meagre salary. Thus, a large number of people and families have no option but to compromise with their health and dignity, according to the report. It highlights three reasons for people’s struggle to access water: lack of money or political will, government inability to deliver and deep prevailing inequalities. With more than 75 million people deprived of sufficient water, India tops the global list of countries where the highest number of people lives without access to safe water. India is followed by China where more than 66 million people are living in the same conditions. Those in India who have no access to a safe water supply are living on around US $4 a day, says the report. If they have the opportunity to buy water from a tanker, it can cost 1 rupee per litre, sometimes double if supplies are scarce. The report states that poor management of water resources is the biggest problem holding the country back from reaching all of its population with water supplies. In India, aquifers provide 85 per cent of drinking water, but levels are falling in 56 per cent of the country. Hand pumps are exacerbating the crisis in many areas by depleting shallow aquifers. As a result, millions of people get insufficient or poor quality water. Communities fall back on a single or distant source for drinking water, often leading to disputes and increased discrimination against the main water fetchers like women and girls, the report explains.